Backup and versioning utility for Final Cut Pro. Is there a better alternative to Pro Versioner? Is Pro Versioner really the best app in Backup category? Will Pro Versioner work good on macOS 10.13.4? Note: Pro Versioner has been discontinued, but is still available for download. 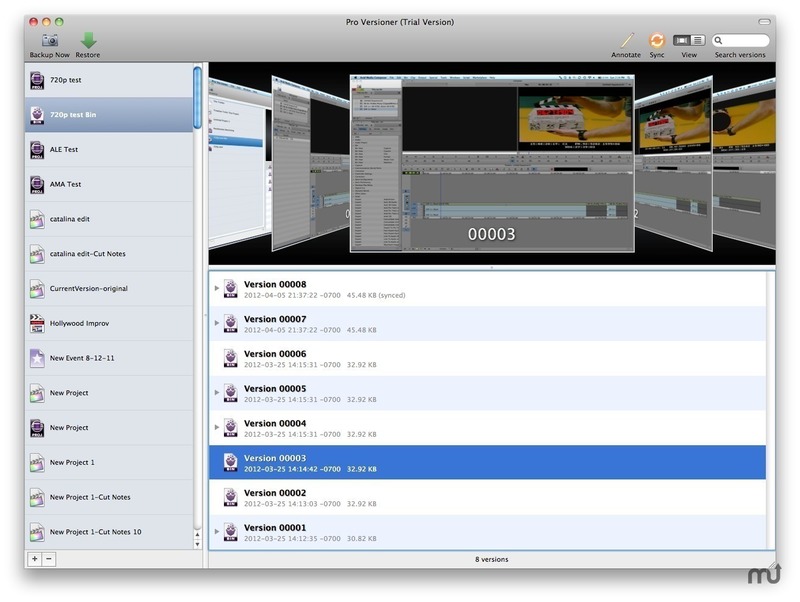 Pro Versioner (was FCP Versioner) is an extensive backup and versioning tool for your project, event and bin files. It creates a backup whenever you save and is a useful way of keeping track of versions over time. Versioning - Every time you save, Pro Versioner backs up your project file. Unlike regular autosave, this gives you a wide time range if you need to restore an earlier version. Pro Versioner has been discontinued. While there will be no further updates to the software, it is operational and can still continue to be used. This update removes the registration code so the software will freely function without the need for a license. Pro Versioner needs a rating. Be the first to rate this app and get the discussion started! Annotations - Differentiate between backups with annotations and screenshots. Backup Management - Extensive backup management options give you maximum control over disk usage. Cloud Sync - Protect your data from hard drive failure, fire or theft by automatically syncing backups to Dropbox. Peace of Mind - Pro Versioner works in the background, automatically managing your project backups to keep your data safe. It also removes Dropbox sync functionality for compatibility reasons. However, Dropbox can continue to be used by choosing your Dropbox folder as the backup destination.